Thermochemical processes convert biomass to liquid bio-fuel and produce biochar, a valuable co-product for soil quality and reduced greenhouse gas emissions. The work of CenUSA’s Feedstock Conversion and Refining Team begins after the perennial-grass feedstock leaves the farmgate. What to do with the raw biomass to make it most useful for the producer and the processor? Converting biomass into value-added products on a commercial scale is crucial to a sustainable biofuel supply chain. While waiting for the biofuel market to develop, biorefineries must find profitable products to keep them in business. One of the team’s first objectives was to develop a technoeconomic analysis (TEA) model of the potential for converting perennial grasses used for biofuels and biorefinery co-products into value-added fuels and useful chemicals, through catalytic pyrolysis processing. A TEA is a using available data from commercial operations. The model can determine the economics of turning perennial grass feedstocks and their co-products, especially lignin, into marketable, value-added products that can help a biorefinery turn a profit. Many of those products may not look much like transportation fuel, but this product diversity strengthens the economics and positive environmental benefits of the biofuel supply chain. Take biochar: long consigned to use as a low-value process heat, this carbon-rich by-product of the fast pyrolysis process is gaining favor as a soil amendment. The Feedstock Conversion and Refining Team is helping to support that advance. Their findings show that value-added biochar can make biomass production for renewable energy more profitable and therefore sustainable. 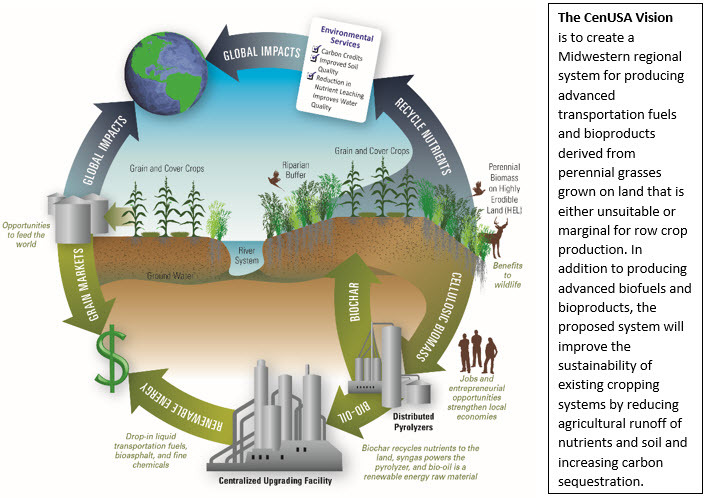 Robert Brown, director of Iowa State University’s Bioeconomy Institute led CenUSA’s conversion and refining projects, while David Laird has led investigations of biochar amendment impacts on soil quality and greenhouse gas emissions. In efforts aimed at commercialization, the team worked closely with two partners: global food processor ADM, and Renmatix, a technology company based in Pennsylvania. Both companies fractionate—or break down into various components—biomass. The cellulose and hemicellulose components are readily marketable, but another major component, lignin, has few profitable uses, so it is mostly burned as a low-value fuel in boilers. CenUSA’s soil scientists and agronomists discovered that biochar can markedly improve soil quality. Biochar is highly porous, helping soil retain water and fertilizer and curb runoff. It has been shown to reduce nitrate leaching by 10% and phosphorus leaching by 40 to 70%, and boost soil aeration, allowing roots to grow. Biochar retains about half the nutrients of the original biomass, and also increases soil organic matter. It is not surprising that research has found that biochar can increase crop yields in poorer soils. Biochar has another benefit, the team found. By returning biochar created by fast pyrolysis to the soil, more stover residue can be harvested for bioenergy without degrading soil quality or hurting crop yields in the long run. 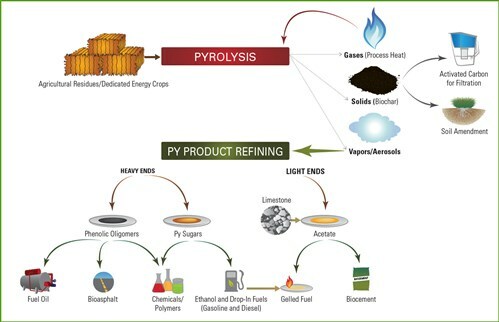 Concept for Pyrolysis Refinery Photo: Bioeconomy Institute at Iowa State University. Much of the research looked at how to maximize the value of lignin from the two commercial partners’ processes and improve their economic performances, by developing two processes to convert lignin into streams of stable, phenolic-rich oil that can be upgraded to fuels, chemicals, and other products. New thermochemical-process technologies developed by the team at Iowa State University will help the partners get more value from the lignin than they currently generate. In the long run, these advances will lead to conversion of grasses into biofuels and such value-added products as bioasphalt, cellulose pulp, fermentable sugars, and carbon fibers. – Developing lignin-specific conversion technology and working with companies that don’t have a good home for their lignin co-product. – Working with industrial collaborators to develop demonstration- and commercial-scale pyrolysis. – Developing nonfuel uses, in addition to biochar, for perennial grasses. The team’s TEA showed that chemical and other nonfuel uses of perennial grasses can be more profitable than producing transportation fuels right now. Some day, small biorefineries will be able to make money turning biomass into fuel. But at the current time, they must rely on nonfuel products to turn a profit and stay in business. Meanwhile, new conversion and refining technologies are establishing themselves in the commercial supply chain, waiting for the large-scale development of transportation fuels sure to happen in the future. Allen, R.M. & Laird, D.A. (2013). Quantitative prediction of biochar soil amendments by near-infrared reflectance spectroscopy. Soil Science Society of America Journal. 77:1784-1794. Brown, T. R., Thilakaratne, R., Brown, R. C., & Hu, G. (2013). Techno-economic analysis of biomass to transportation fuels and electricity via fast pyrolysis and hydroprocessing. Fuel 106, 463–469, http://dx.doi.org/10.1016/j.fuel.2012.11.029. Brown, T. & Brown, R. C. (2013). A review of cellulosic biofuel commercial-scale projects in the United States. Biofuels, Bioproducts & Biorefineries 7, 235-245. DOI: 10.1002/bbb.1387. Brown, T. & Brown, R. C. (2013). Techno-economics of advanced biofuels pathways. Royal Society of Chemistry Advances 3 (17), 5758 – 5764, DOI: 10.1039/C2RA23369J. Fidel, R.B., Laird, D.A. & Thompson, M.L. (2013). Evaluation of Modified Boehm Titration Methods for Use with Biochars. Journal of Environmental Quality. 42:1771-1778. Kauffman, N., J. Dumortier, D.J. Hayes, R.C. Brown, and D.A. Laird. 2014. Producing energy while sequestering carbon? The relationship between biochar and agricultural productivity. Biomass and Bioenergy. 63:167-176. Thilakaratne, R., Brown, T., Li, Y., Hu, G., & Brown R.C. (2014). Mild catalytic pyrolysis of biomass for production of transportation fuels: a techno-economic analysis. Green Chemistry, DOI: 10.1039/C3GC41314D. Zhang, Y., Hu, G., & Brown, R. C. (2013). Life cycle assessment of the production of hydrogen and transportation fuels from corn stover via fast pyrolysis. Environ. Res. Lett. 8, 025001 doi:10.1088/1748-9326/8/2/025001.